Additional Thoughts: This is a small, simple book with just 51 recipes. But each recipe is a star in its own right. This books showcases the beauty, flavor, textures, and nutrition that you can get in a soup by simply focusing on fruits, grains, and vegetables. 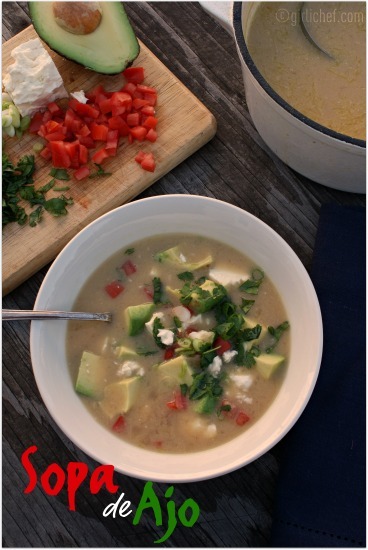 I added chicken broth instead of using just the water called for when I made the Sopa de Ajo (pictured below), but this was out of personal preference...and using up some broth I'd made a day or so earlier. Alley is a soup-lover and a slow-cooker expert. 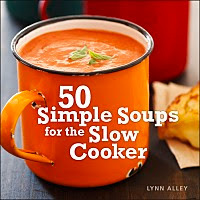 This is a fun little book to add to your collection if you're a soup lover, a fan of meals you can cook up in the slow cooker, a vegetarian...or if you simply wish to beef up your cookbook collection with a good book of tasty soups. I think it would also make a fabulous gift for someone heading off to college (with a slow cooker and an immersion blender alongside) or perhaps a young person or couple embarking on a new chapter in their life. about the author (from Amazon): Lynn Alley began her career in cooking as a middle school teacher where she and her students gained notoriety selling their hand made gourmet items at Neiman Marcus. Alley long ago began writing and saving recipes so that down the road she could write the cookbooks for which she has become known. 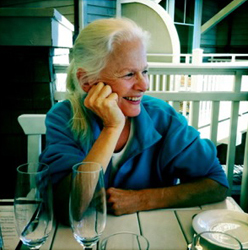 Since leaving the classroom, she has traveled to teach cooking in southern France and at cooking schools throughout the western United States. She has, over the years, contributed articles on both food and wine to the San Diego Union Tribune, the Los Angeles Times, the San Francisco Chronicle, Fine Cooking, Cook's Illustrated, The Herb Companion, Health, Natural Home, Organic Style, and Organic Gardening, and has authored six cookbooks. For more than ten years, she has also been a regular contributer to the Wine Spectator online and magazine, and her "Conscious Cook" blog appears weekly on the Yoga Journal's website, yoga journal. com. An avid animal lover, she has also contributed article on animal diet, travel and wellbeing to the Natural Dog, Dog Fancy, and the Herb Companion. An ideal book for the soup lover. Love my slow cooker and make a pot of soup once a week; will have to look this book up. I love your book reviews - very descriptive! Apple pie soup, hmm? I think you'll have to try that one for me. Very curious about that one. Dear girlchef I love soups every time of the year always I make! and this book sounds amazing!! Nice review! I love making soup when the weather turns cold. I think I need to pull out my slow cooker and check out this book! Sounds interesting - I'm looking forward to seeing what other recipes you post! Love how colorful that soup is. Great review--great minds again--I reviewed it today too. I really enjoyed this book as well--it took me about 2/3 into it before I realized that it was vegetarian/vegan. ;-) I want to make the garlic soup soon--the Spanish Potato and Olive Soup was quite tasty. This is the second review I've seen of this book -- and it looks great. I too tend to use chicken broth instead of water. I'm crazy about the sound of the spiced apple soup, as well as the potato blue cheese that you mentioned. This sounds like a really nice book with some unique ideas for soup. Definitely right in time for soup season. Sopa de Ajo looks muy bueno. (I'm taking a Spanish class but I don't know how to write the whole sentence yet.) My husband and I love garlic so I'm going to try this one. (I saw your recipe in an earlier post.) Looks like I need to find a copy of this little book. Perfect time of year for the slow cooker! Love the slow cooker and love soup! Thanks!